Marokopa Falls is a large, grand waterfall in the Waikato region of New Zealand. It is known for its natural beauty, cool, clean water and rich green vegetation that grows around the waterfall. 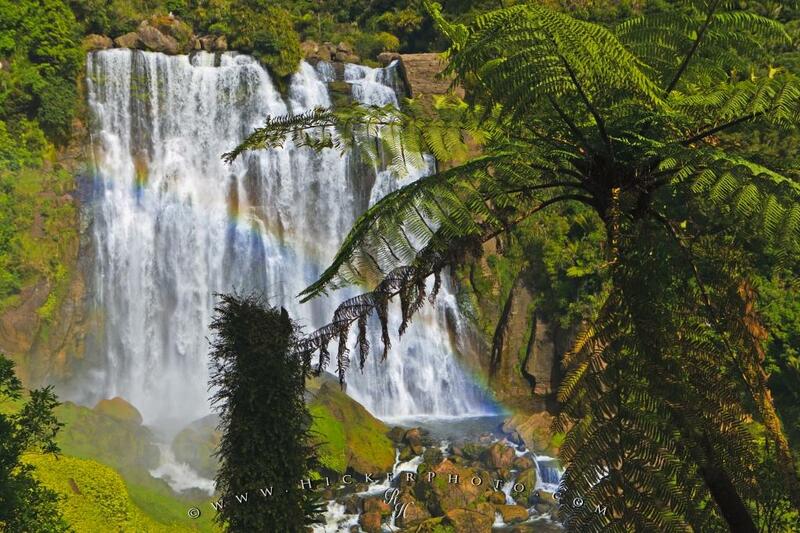 Marokopa Falls is described as one of the most beautiful natural waterfalls in New Zealand. The top is about 36 metres above the bottom and as can be seen in the photograph it is a very rocky and wide waterfall. There are viewing platforms from below the falls, such as where this photograph is taken from, and from the top however, it is very difficult to get to the top to look down on the water and the pool below. Photo of Marokopa Falls, in the Waikato region, an area in the North Island of New Zealand. ... It is not a hard walk to get to the falls and you won't have to wear hiking shoes in order to get there. This area of New Zealand is known for its beauty; with its hills, valleys, lakes and rivers. Waterfalls just like this one are still a rare site, especially ones of such natural beauty. This waterfall will always be breath-taking to anyone who has the luck of seeing it in the flesh. Marokopa Falls, Waikato, North Island, New Zealand. I photographed this photo with the digital SLR camera model Canon EOS-1Ds Mark II, aperture of f/7.1, exposure time of 1/160 sec. on ISO 50, as always I used a original Canon Lens, the focus lenght for this picture was 46mm.